The iPhone doesn't even crack the top five smartphone list in China, but a cheaper model could help Apple break into the fast-growing market. Apple is accustomed to being the smartphone king, but in China, the iPhone is barely even an also-ran. The iPhone is currently in seventh place in China, according to research firm Canalys. That means Apple is missing out on a huge opportunity: The Chinese smartphone market is exploding, with sales more than doubling over the past year. One-third of all smartphones are now sold in China -- more than the United States, India, Japan and the United Kingdom combined. Apple (AAPL) is No. 1 or No. 2 in almost all other countries where it sells the iPhone, but most of those markets are far more saturated. Smartphone sales in the United States, for instance, grew by 36% last year -- still a healthy clip, but far slower than China. "The smartphone industry is maturing; growth is shifting from premium to mass market, where ... Apple lacks presence," Indigo Equity Research Nick Landell-Mills wrote in a note to clients last month. Next month, Apple may finally unveil its solution to the China problem: Apple is expected to announce the long-rumored low-cost iPhone, dubbed the "iPhone 5C," on Sept. 10. On a conference call with Wall Street analysts last month, Apple CEO Tim Cook didn't acknowledge rumors that Apple is working on the iPhone 5C, but he did say the company is working "very cautiously with what we want to do with great quality." That high-quality approach worked in the U.S. and the rest of the world. In China, by comparison, price is a big issue. Phones aren't often subsidized by wireless carriers in China like they are in the United States, and that puts a top-shelf device like the iPhone outside the price range of many Chinese consumers. "Apple offers very high-end, high-priced devices," said BGC Partners analyst Colin Gillis. 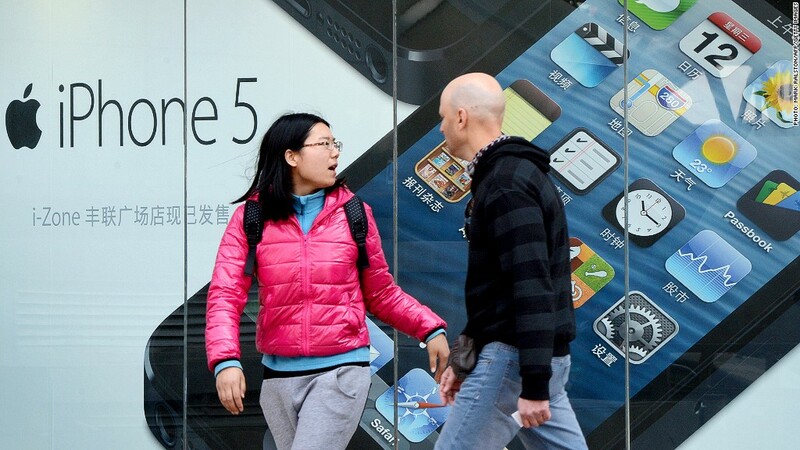 "But in China, Apple needs to address the marketplace. The obvious step one is creating a product that people can buy. Apple hasn't done that yet." And so Chinese consumers have turned to cheaper phones from Samsung, as well as local brands such as Lenovo, Yulong and ZTE. Those companies have been able to introduce reasonably priced phones to China, get a strong foothold in the market, and continue to drop prices, Gillis said. He suspects Apple's "cheap" iPhone will still come in at about $400, and he thinks that won't be low enough to set the Chinese market ablaze. "You have to wonder: If Apple is coming in at $400 when everyone else is heading down to $200, what will happen?" Gillis asked. Even if Apple does release a phone that's cheap enough to attract Chinese consumers, the company still faces a giant roadblock: Apple hasn't been able to secure a deal with the country's largest carrier, China Mobile (CHL). The wireless giant accounts for 65% of the nation's mobile subscribers. Apple and China Mobile have been squabbling over carrier subsidies, and a cheaper iPhone would make China Mobile more likely to sign on, according to analysis firm Trefis. "The potential for Apple to ride the boom is huge," Trefis concluded. "In order to do so, however, Apple needs a cheaper iPhone."